Ok How do you get through the door there is a gaurd there. She is at J-6 with the drunk pirates. The room is upstairs behind the first oaken door. 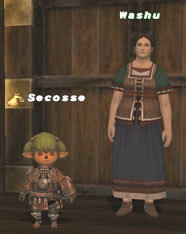 What's with the Tenchi characters in FFXI? nan des no kono miso shiru wa? "You can call me Miss lil Washuuuu"
They have semi-common japanese names, which you'll see in alot of jp games and stories. Currently: Criminals don't register their guns in New York? Why, how very shocking!